Russian spies have been accused of involvement in a series of cyber-plots across the globe, leading the US to level charges against seven agents. The allegations are part of an organised push-back against alleged Russian cyber-attacks around the world. Russia earlier dismissed the allegations as "Western spy mania". In Malaysia, the Netherlands said, it was used to target the investigation into the downing of Malaysia Airlines flight MH17 in 2014 over territory held by Russian-backed rebels in eastern Ukraine. All 298 people on board were killed. The revelations about how the British and Dutch security agencies disrupted the operations of the GRU are astonishing in their detail and their openness. This is not what secretive intelligence agencies normally do. But the willingness of both countries to be so candid illustrates how determined both they and some other Western governments are to try to push back against what they see as a concerted pattern of Russian aggression. "I imagine Mr Putin is shouting at one or two people right now," a cheerful British official told me. Russia's foreign ministry - which had earlier dismissed the allegations from the UK and the Netherlands as "Western spy mania" - released an official statement late on Thursday, saying it was the victim of "yet another stage-managed propaganda campaign". "It's unclear who is supposed to believe these statements accusing Russian citizens of attempting to mount cyber-attacks against the OPCW and trying to obtain data related to the Malaysian flight MH17, as if it is necessary to be near the target of your attack," it said. "Any Russian citizen carrying a mobile device is seen as a spy," the statement added. He said the attacks were how Russia retaliated for bans on its athletes following evidence it was systematically using drugs to enhance their performance. They were also charged with wire fraud, identity theft and money laundering. A joint statement from British Prime Minister Theresa May and her Dutch counterpart Mark Rutte said the alleged plot against the OPCW demonstrated "the GRU's disregard for global values and rules that keep us all safe". The four suspects identified by Dutch officials had diplomatic passports - which meant the Netherlands could not arrest them as diplomats are in theory immune from prosecution in their host country - and included two IT experts and two support agents, officials said. The four hired a car and parked it in the car park of the Marriot hotel in The Hague, which is next to the OPCW office, to hack into the OPCW's wifi network, Major General Onno Eichelsheim from the Dutch MIVD intelligence service said. Equipment in the car boot was pointed at the OPCW and was being used to intercept login details, he said, adding that the antenna for the operation lay under a jacket on the car's rear shelf. 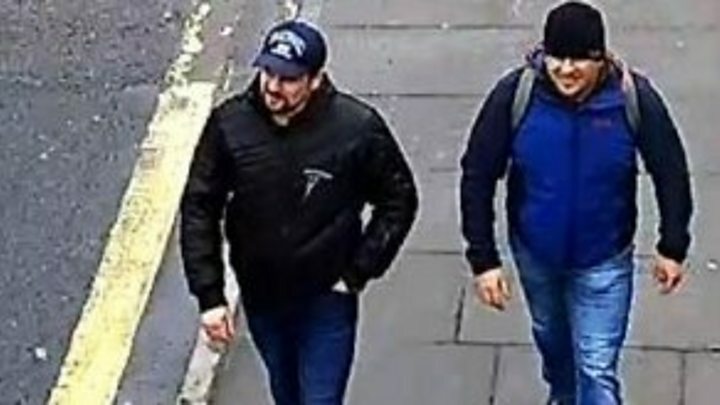 He said one of their mobile phones was found to have been activated near the GRU building in Moscow, while another carried a receipt for a taxi journey from a street near the GRU to the airport. Maj Gen Eichelsheim said the group were planning to travel to Switzerland, to a laboratory in Spiez where the OPCW analysed samples. 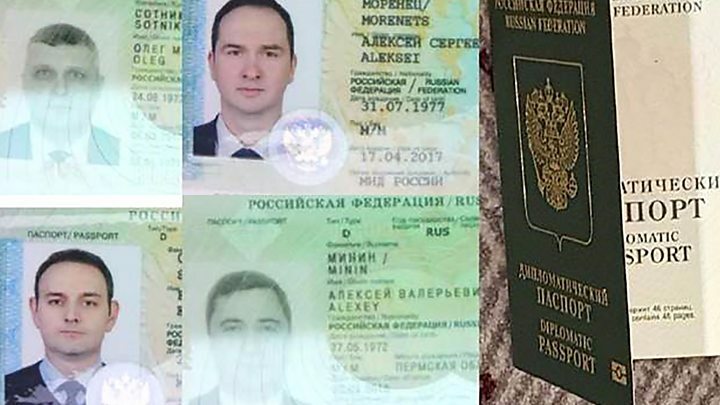 They were named by the MIVD as hackers Alexei Morenets and Yevgeny Serebriakov, and support agents Oleg Sotnikov and Alexei Minin. Officials said they were from the GRU's Unit 26165, which has also been known as APT 28. The UK's ambassador to the Netherlands, Peter Wilson, said the unit had "sent officers around the world to conduct brazen close access cyber-operations" - which involve hacking into wifi networks. He said the hackers were planning to travel on to the OPCW-certified laboratory in Spiez near Berne in Switzerland, where the Novichok nerve agent used in March's attack on Sergei Skripal and his daughter in the British city of Salisbury was identified. "With its aggressive cyber-campaigns, we see the GRU trying to clean up Russia's own mess - be it the doping uncovered by Wada [the World Anti-Doping Agency] or the nerve agent identified by the OPCW," Mr Wilson said. The cyber-operation in Malaysia targeted the attorney general's office and Malaysian police as well as the investigation into MH17's shooting down, Ambassador Wilson said. Earlier this year Dutch-led international investigators concluded that a missile that brought down MH17 belonged to a Russian brigade. Russia has denied any involvement in the plane's destruction, which led to the deaths of many Dutch citizens.